LEDs draw very little electrical power and have a very long life-span so you can leave your Rope Lights running continuously in winter. These will provide some warming of the air in the safe, which helps prevent rust by raising the dew point. We still recommend that you use a GoldenRod or similar warming unit, placed at the bottom of your safe, plus desiccant packs to actually absorb moisture. For more tips on how to illuminate your safe and protect its contents from rust and corrosion, read our Gun Safe Buyers’ Guide. 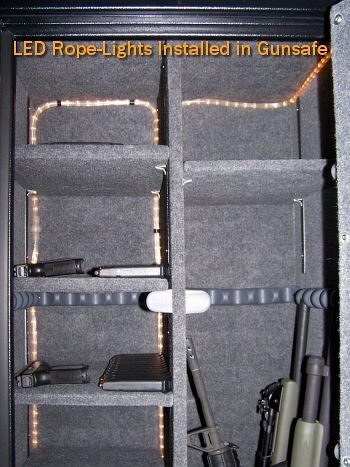 The most comprehensive Gun Safe Resource on the web, this article covers a multitude of topics including lock selection (electronic vs. manual), fire-proofing, door hinge design, water-proofing, wall construction, rust prevention, and gun safe installation. 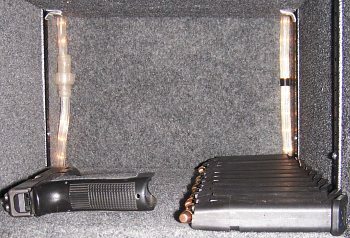 Share the post "Let There Be Light… For your Gun Safe"
Most true LED rope lights are about $90 – $150 per 50 foot section. I think you guys used indecent lights that get much warmer. I actually just got back from Lowes, and the package says they need to be in an area with very good circulation because of the heat they produce. Have you guys had any issues as of yet? Those are definitely incandescent rope lights. LEDs would be a cooler color (more blue). I’d be hesitant to let those (incandescents) run continuously inside my safe.